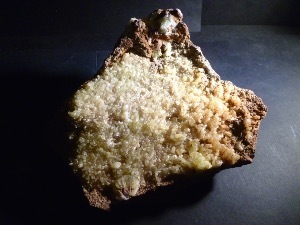 Adamite is a zinc arsenate mineral, with an orthorhombic crystal structure, and it often occurs in radiated aggregates of fan-shaped rosettes. The majority of specimens are an inch or less in diameter. It is usually a bright yellow-green colour, but it can also be honey-yellow, brown white, pale green, blue-green or colourless. It forms in oxidised parts of ore veins, especially arsenic-rich zinc deposits. Most of the finest pieces of Adamite are from Mexico and Namibia.